Rigid construction for protecting your water bladder free from accidental damage. The whole pack measures 40x20x8cm, comes with 2 lite Hydration (included). A small opening at the top let the drink tube to pass through. Fashion the pack by adding your favourite patch onto the large velcro. The extra pouch allows you to store accessories and fighting equipment. 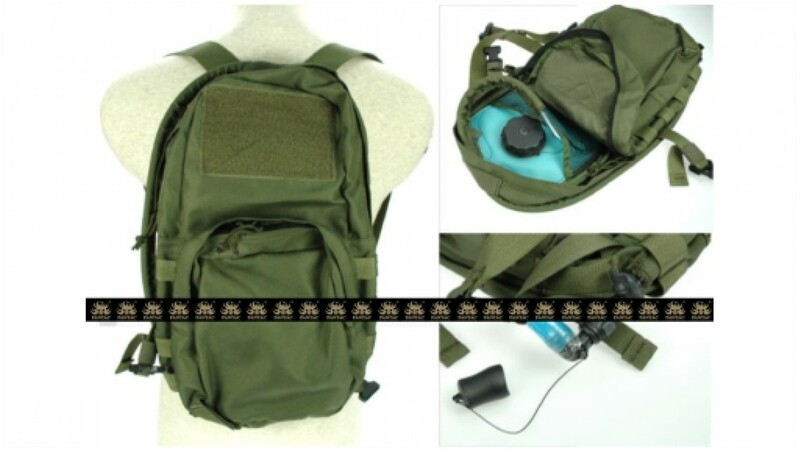 Carry this pack either by the sling, or attach it to the vest via the MOLLE platform on the back. Secret compartment lets you hide the back pack straps when used on a Molle system! Great accessory for using on the Phantom CIRAS Khaki version for color matching. Constructed with rigid and durable INVISTA Cordura 1000D.